Music promotion has come a long way since the days of handing out fliers and free beers to get attention. The internet has changed how to promote your music, offering a variety of tools and a potentially-global fan base, all from the computer or mobile device at hand. Knowing how to promote your music is important. While you could use a fan page or profile on a certain social media platform as your main page, the world of social media is constantly changing and growing. It might be best to have a dedicated site for your band, then use the social media outlets as tools to support that site. Facebook – This popular social media site is ideal for telling brief stories, sharing photos and videos, and creating events; lets you reach friends, family, fans and their networks. Twitter – Twitter is perfect for announcements, shout-outs, and networking; utilize the hashtag tool for cross-referencing. Google+ – Google+ is great for sorting connections into arbitrary circles such as bands, venues, label and fans. YouTube – Get your music heard even without a record by posting videos on YouTube. MySpace – MySpace is highly customizable, allowing you to promote your music while matching your personality and style. Instagram – Create a video/photo diary of your band’s progress and easily share on your other social media platforms. Again, utilize the hashtag tool. LinkedIn – This networking tool can be great for making industry contacts and joining groups for artists. Be present – We don’t mean post every day at 11 a.m. and 3:30 p.m., but do post often. This keeps your fans from forgetting about you. Absence does not make the fan grow fonder. That said, don’t flood your fans with too many posts. Get involved – One of the biggest differences between a great show and a terrible one is the level of interaction between the bands and the fans. The same goes for social media. If you want your fans to stick around, pull them into a conversation by ending posts with a question. Just don’t forget to respond. Don’t get pushy – If all of your posts sound like sales pitches, your fans will lose interest. Keep your posts to promotions, stories, and videos. Use multiple sites – Don’t rely on just one site. If you post an image on Instagram of last night’s concert or uploaded a new music video on YouTube, share it on your website, Facebook, and Twitter. Sites like HooteSuite make managing multiple accounts easier. Join forces – If you make friends with other talented bands in your genre or have upcoming gigs with other bands, you can combine efforts to reach more people. 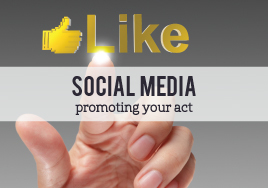 If you know how to use the different types of social media, then you know how to promote your music. Because you need to do more than just practice to get noticed. Which social media tools do you use? Which have you found to be most effective?